For a grilling option that is perfect for both indoor and outdoor cooking, the George Foreman Indoor/Outdoor Electric Grill is an optimal choice. Offering a large grilling space, you can choose to prepare your foods in the kitchen or the patio. The versatility of this grill allows users to grill during any season or weather. Imagine planning a cookout and a storm starts out of nowhere. With the George Foreman Indoor/Outdoor Electric Grill, your plans do not have to change! Simply keep the cookout indoors! The George Foreman Indoor/Outdoor Electric Grill is a good choice for grillers who want to be able to cook more. The grill has 200 square inches of grilling surface, which allows you to make at least 12 hamburgers, perfect for large families or get-togethers. The secret to perfect grilling is temperature. The meats you prepare need to reach a certain temperature in order to cook properly without drying out or burning. With this grill, you have the ability to adjust your temperature controls to the setting you prefer. Five heat settings provide optimal temperature for whatever you decide to grill. One major plus to this grill is the ability to cook indoors. You can easily use the grill inside the home as it operates via an electric system. Enjoy quality grilling within your home when it is too cold to go outside or the weather is not cooperating. There is no need for propane or charcoal, simply plug the grill in and set the temperature, and you are good to go! If you grill often, you know the cooking surface of the grill can get quite messy. With this grill, the mess can easily be cleaned up. The grill includes the George Tough Nonstick Coating. This coating is durable and easy to clean, plus it means the grill does not require any oil or butter for cooking! At the time of writing this grill review, the George Foreman Indoor/Outdoor Electric Grill in red was reviewed by just over 284 consumers at Amazon. The grill received 4 out of 5 stars, with more than 55% of users giving the grill a 5-star rating. Overall, users enjoy the prize and ease of use with this grill, including having the ability to cook both indoors and outdoors. To the negative, only a small percentage of consumers found the grill to be lacking. Around 8% of reviewers gave the grill a 1-star review. Most of the negative reviews center around stability instead of the cooking aspects of the grill. Consumers complained that the grill is not steady when used on the base and seems unstable. Uneven cooking was also a complaint. Despite some negative reviews, the good certainly outweighs the bad. Consumers who enjoy this grill love the look as well as cookability of the George Foreman grill. Grillers enjoy not having to purchase charcoal or propane and instantly being able to cook instead of waiting for a fire to become hot enough. Consumers stated in reviews … “I love it and is great” … “Nifty in the kitchen or on the patio” … “great alternative to gas”. Overall, consumers seem to really enjoy this grill and recommend it for purchase for a variety of reasons. 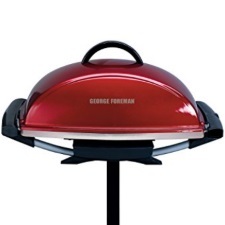 When in the market for a new grill, it seems the George Foreman Indoor/Outdoor Electric Grill in red is a top choice for a number of reasons. The main reason is having the ability to cook both indoors and outdoors. This is a major plus. Most everyone has planned a cookout and it ended up raining. With a charcoal or gas grill, you may be unable to continue with the cookout if no covered outdoor space is available in your home. With this grill, you simply bring the unit inside and cook! No muss, no fuss. This is a definite advantage with this George Foreman creation. With an affordable price point and easy cleaning, the grill is a good choice for families, couples or even individuals. With so many positives, it is an easy decision to choose this grill for all your cooking needs. The grill is already affordable but considering the versatility of the unit, it makes even more sense at the low price point. Imagine all the cooking you could do, be it indoors or outdoors!